Heat oil in a large pot over medium in high heat. Add onion; saut 3 minutes. Add garlic, saut until fragrant.Stir in bell pepper and tomatoes to the pot. Add chili powder, cumin, and oregano, cook 1 minute. Add the broth and bring to a boil.Cover, reduce heat, and simmer for 10 minutes. 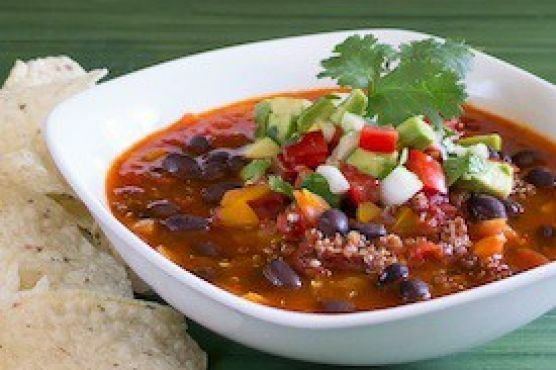 Add black beans and heat until warmed through.Stir in lime juice.To serve, place a quarter cup of cooked quinoa in a bowl and top with chili.